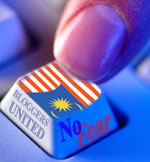 I refer to the malaysiakini report Religious status: Legislators want PM to act. These case and others like the S Shamala, Lina Joy, M Moorthy and R Subashini cases have brought to the fore issues like the rights of individuals to choose their religion and the erosion of the rights of non-Muslims because of the failure on the part of the judiciary to defend the constitution. In the case mentioned in the report above, the authorities have detained the mother and forcibly taken away her child and given it into the care of a grandmother (who has been given stamp of approval by the religious authorities). M Revathi is being detained at a rehabilitation centre though. I thought only the police could arrest someone. It appears that in Malaysia, we not only have Rela who can detain ‘illegal immigrants’ but now have religious authorities who can ‘arrest’ and ‘rehabilitate’. How did this happen? Rela was created by Emergency Legislation after May 1969 and the muscles we see them flexing have been actually confirmed by our esteemed Parliament. You mean the Emergency legislation passed in 1969 is still in effect? Oh yes, it hasn’t been revoked. Where did Malacca’s Taliban-like religious authorities get their powers? Oh, they were approved by the Malacca state assembly. Every state in this country, except for Kelantan, is run by a Barisan Nasional majority state government. You mean it wasn’t PAS who passed this type of legislation? No, it was actually the Barisan Nasional who is responsible for all these laws. My question is what kind of law forcibly separates a mother from her child and actually condones brainwashing? Who looks out for the well-being of Revathi to make sure that she is not being ill-treated or are we expected to trust the goodness of the good Muslims who arrested her? Where are the rights of her husband? Where are the rights of her child? What is being done to this woman and her child is unprincipled and immoral by any standards. What happened to freedom of religion? The freedom to choose to believe or not to as the case might be. What right do the arresting officers have to decide a person’s religion? Every time something like this happens, we are told that Islam is a compassionate religion. I have been told by Muslim friends that in the time of the Prophet, he actually practised freedom of religion. Why then is there such a stark difference between what the Prophet did in his lifetime and how Islam is practised in Malaysia? Why is there such a stark difference between word and action? How can coercion and separating a child from her mother be considered ‘compassionate’? I often wonder what the Prophet would say and do if he saw what was being done in the name of Islam in Malaysia. ‘We are like oblivious frogs swimming in a cauldron that is slowly coming to a boil. By the time we realise we are cooked, it will be too late’. Welcome to the next Taliban country? The religious bigots are increasing in number and the government is clueless as to what to do with them. Even the courts fear them. Eventually, it will the minority ruling the majority. The Hamas, Hisbollahs are examples of what will come of this country. The irony of it all is the non Muslim parties in the BN have nothing to say. They let it happen to the detriment of their race.